The school year coming to an end, and high school kids across the country are starting to get their yearbooks, seniors are graduating, and dreams are flourishing. Graduation is always a scary but exciting time too because for the first time we're moving on from the structured regiment of school we're used to and given freedom to pretty much define our own destinies. It's also a time to have one last shot at what you want y our high school class to remember you as. Your senior picture is pretty much permanent so one bad go and you're stuck with being that weird kid on page 33. Students have gone to great lengths to have a fun picture to include, posing with weird items, including some really over the top quote it'll take pretty much the whole class decades to finally catch, or even posing with service animals. Last month, a service dog who had saved his owner's life made it into the school yearbook. It was pretty adorable. But not to be outdone, Twitter user Gaby Sazarcon's sister recently graduated, and for her yearbook photos, she decided to take it to the next level. 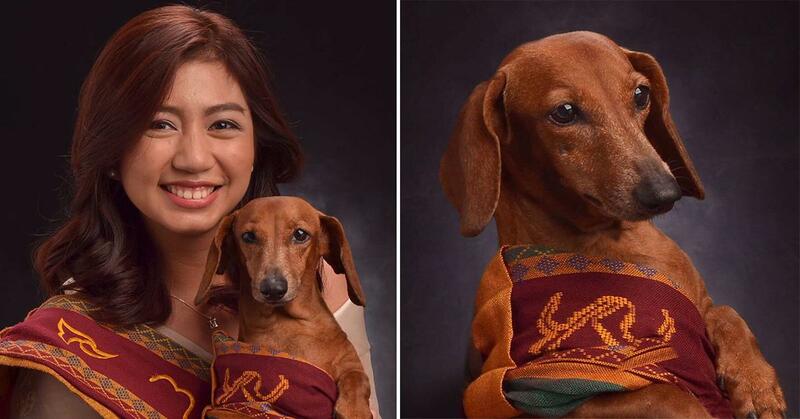 The girl posed with her family dog in her Senior photo. Yes the family pupper is now going to be immortalized in the yearbook in her photo and she'll now forever be known as "that girl who decided to pose with her dog in the yearbook." Probably a decent trade off if you ask us. Unsurprisingly, people found the little graduate pretty adorable. We can blame them as the pupper is definitely very photogenic. THIS IS SO AWESOME. Congrats to your sister, Gaby, and hugs to your dog! Hopefully doggo can get a gob job and pay off all that student debt. At least he's got a future in modeling if he wants cause he nailed it with these.